Clarksville, TN – After hanging tough with back-to-back FBS opponents, the Austin Peay State University football team returns home to take on Morehead State. Kickoff is slated for 6:00pm, Saturday at Fortera Stadium. 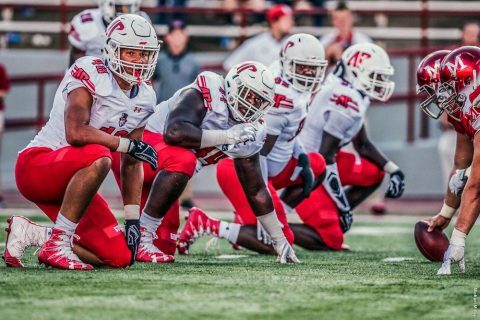 Despite falling just short in their two opening contests, the Govs’ defense has positioned itself as one of the top units in all of FCS. Gunnar Scholato has been the rock of the group, racking up 19 tackles thus far after notching a team-high 124 in 2016. Malik Davis posted a 12-tackle performance last week at Miami to lead all Govs in a dominant defensive effort, which saw APSU hold the FBS Redhawks to minus-one yards of offense in the third quarter. As two former Pioneer Football League rivals, Austin Peay is set to host a familiar foe in Morehead State. The Govs are 17-27 all-time against the Eagles, with the most recent contest resulting in an APSU road victory, 23-21, in 2006. The rivalry dates back to October 13th, 1962 and APSU holds a 10-9 advantage when the programs meet in Clarksville. Morehead State opened the year with dominant 56-14 win over Kentucky Christian, before dropping a 58-17 decision to FCS No. 20 Liberty this past Saturday. Eagle wide receiver Jarin Higginbotham has amassed an impressive 168 yards on just six catches and has cemented himself as one of the top playmakers in all of FCS. For the first time in program history, APSU held back-to-back FBS opponents to under 300 yards of total offense. The Govs rank first in the Ohio Valley Conference, surrendering just 271.5 yards per contest. Overall, the two straight outings holding opponents under 300 yards is the first time the program accomplished the feat since 2001 (November 3rd Saint Joesph’s, November 10th Davidson) and the first time since 1996 the Govs have held consecutive Division-I competitors under 300 yards (September 21st Western Kentucky, September 28th Southeast Missouri). Morehead State head coach Rob Tenyer is in his 17th season working with the Eagles football program. He served as the program’s offensive coordinator in 2011 and 2012 before being promoted to head coach in 2013. It will be a battle of wills between the Governors’ defense and Eagles’ offense. Morehead State quarterback Lawson Page ranks sixth nationally in completion percentage (72.2 percent), while APSU ranks 11th in passing yards allowed per game (148). Eagle punter Bradley Boone is one of the most efficient special teams’ players in the country. He averages 42.7 yards per attempt, which is good for fourth in the FCS in net punting. Ironmen Jule Pace and Jeremiah Mitchell have each appeared in all 36 contests since joining the Govs as freshmen in 2014. Be sure to follow all things Austin Peay football at LetsGoPeay.com and the official Facebook page of Austin Peay Athletics. In addition, live play-by-play coverage can be found on Twitter (@AustinPeayFB) and Peaystats.com. Live coverage from this weekend will be provided via streaming (OVC Digital Network).